During the banquet at Audi Club Northwest’s Quattrofest 2013, I bid and won one of the items that were up for auction: a voucher for an extended test drive of an Audi through Sunset Audi. Well, as time flew by and finally getting a three day weekend, I decided to cash in that voucher and got a well-loaded Daytona Gray Audi A6 TDI to drive for the better part of two days. Those that follow this blog, my Twitter account or Facebook page would already know that I had driven an A6 TDI already last year. 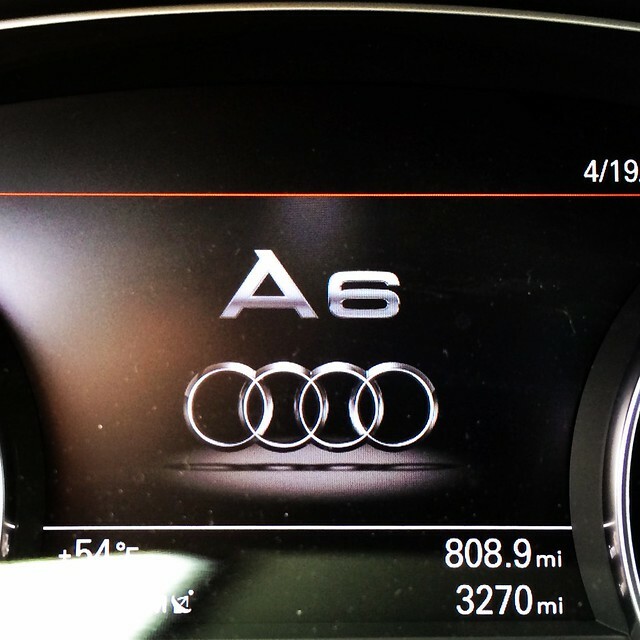 So, why would I write about driving another A6 TDI? Well, I mostly drove my first A6 TDI between home and work and chose to not use any of the fancy Drive Assistance package goodies. This time, I opted to see how well the A6 TDI handled longer trips, city driving and the oodles of technological goodies that it had. 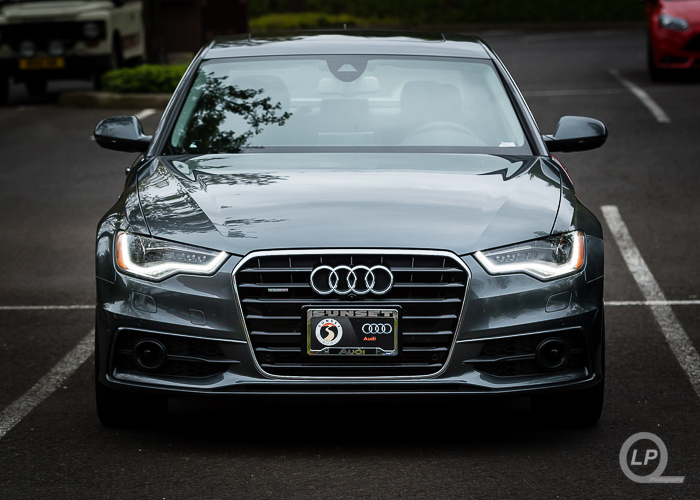 The all of those options and packages bumped up the base sticker price of an A6 TDI Prestige from $60,300, without destination charges, all the way up to $72,295.00, with destination charges. About half of that price jump is just the Bang & Olufsen Advanced Sound System with pop-up speakers. When I got the A6 TDI home, I grabbed a couple of things and headed towards Tillamook, Oregon for the semi-annual visit of the Tillamook Cheese Factory and Tillamook County Smoker to stock up on cheese curds, cut ends, pepperoni sticks and jerky. If you have a feeling of dèjá vu, you would be correct. My last visit to both places was in an Audi A8 L 4.2 all the way back in August 2013. On the way to Tillamook, I opted for the more straightforward route of heading west on US Highway 26 and down Oregon Highway 6. The roads were nice and clear, there wasn’t a lot of traffic and only ran one road construction project. For 90% of the trek, I kept the transmission in manual mode and gave it almost no chance to shift into 8th gear. For most of that leg of the trip, I was between 4th and 6th gear due to the need to climb up and descend through the coastal mountain range. This also kept the torque-happy TDI engine towards the higher end of its torque band and allowed for engine braking. I also made use of the passing lanes to experience some of that torque-y goodness and the engine paid back with its diesel-y growl. The non-sports suspension of the A6 TDI really helped soak in some of the rough roads while not feeling floaty. There was a bit more front push than I’m normally used to in the 2004 A4 and 2011 S5 due to the heavier engine mounted in front of the transmission. The lack of paddle shifters and the comfort seats were another reminder that the car was not fully meant to be a sports sedan. That said, the A6 TDI felt capable and made the drive pretty comfortable. After picking up bags of noms and goodies, I took a slight detour back home to enjoy a few more twisty roads and other scenery. I didn’t change how I drove the A6 TDI, though did bump it into 7th gear for some of the straighter stretches of road. By the time I got home, the on-board computer clocked in an average MPG of 36 MPG. Even if the computer had over-estimated the MPG by 10%, 33 MPG was very impressive as I chose not do the eco-thing with the A6 TDI. 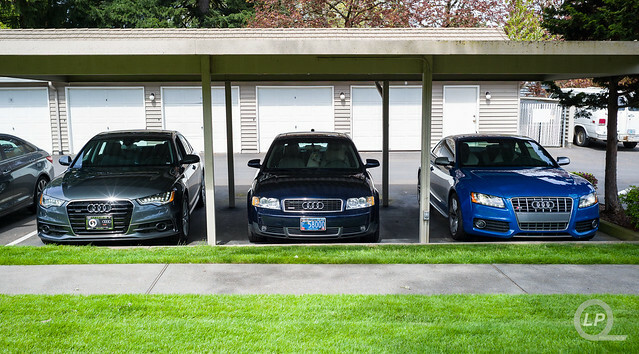 I had the keys to three Audis: A6 TDI, 2004 A4 and 2011 S5. After a quick stop home, I drove the A6 TDI around downtown Portland and headed over to Fire On The Mountain for some spicy Raspberry Habanero wings and went to Salt & Straw for dessert. Parking the A6 TDI was made pretty darn easy with the front and rear parking cameras and sensors, as well as the top view camera. The folding side mirrors also helped squeeze through some of the tight side streets in Northeast Portland. The trek back towards home allowed me to test out the adaptive cruise control with stop and go with the not-so-hot traffic on I-5. While I was in a clear spot on the freeway, I set the cruise control to 55 MPH and distance control to two notches back. 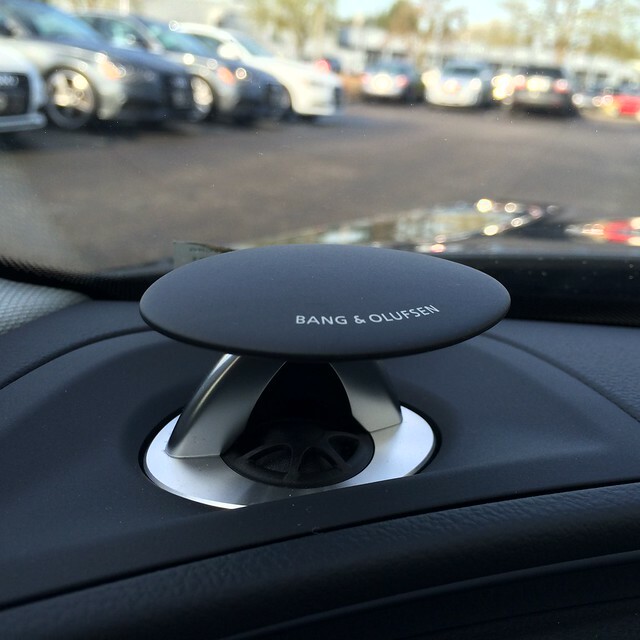 As traffic slowed down and sped back up, the adaptive cruise control did it’s job smoothly. There was an instance in which the car in front had to stop abruptly due to an idiot changing lanes without notice or use of signals. The brake assist kicked in and alerted and assisted in stopping the car. The adaptive cruise control with stop and go also did its job to slow the car down and stop as needed. Saturday mornings is almost always means a stop at Portland Cars and Coffee for me, and this past Saturday was no exception. The weather started out okay, but then the clouds came in and decided to rain on the area. Thankfully, the rain eventually let up and allowed Cars and Coffee to end on a relatively dry note. There were a crew of Audi fans and owners that came down from the Seattle area and one brought down an Estoril Blue Audi S6 and others brought down a B5 S4 Avant and a few other nice Audis. After coming home from Cars and Coffee for lunch, I drove around the West Hills of Portland and then out towards Sherwood and Farmington to check out several garden and nursery stores to check out what vegetables and peppers were available to plant. Unfortunately, it wasn’t quite the right time to find the right pepper plants yet. The A6 TDI soaked in the miles with ease and would have provided a good amount of cargo space in the case we needed to haul something home. About an hour after getting home from all of that, it was time to bring the A6 TDI back to Sunset Audi and hand back the keys. But, before I did that, I had to fill the fuel tank back up to full and that also gave me a chance to calculate the approximate fuel economy from all of that driving. After around 270-280 miles of driving, it took about 7.9 gallons of diesel to fill the tank. Throwing those numbers at a calculator, as my long division skills are rusty, that netted around 34 MPG +/- 1 MPG. That fuel economy and the grunt of the 3.0 TDI engine is making me really, really consider getting an A6 TDI to eventually replace my 2011 S5 as a daily driver. 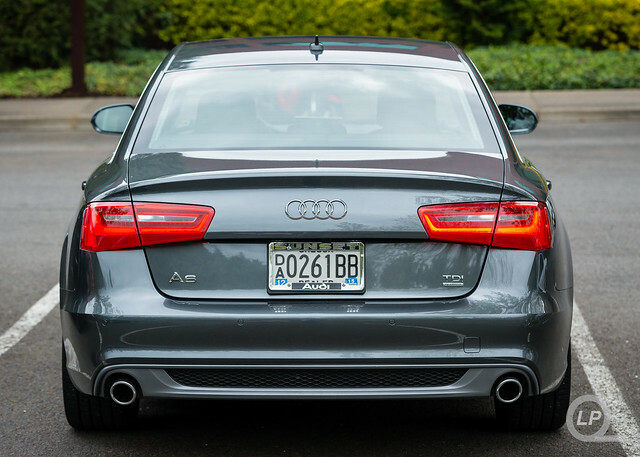 If I were to go with an A6 TDI, I would configure it differently from the A6 TDI that I got to drive. Gone would be the Bang & Olufsen and Cold Weather package and adding the 20″ Sport Package, layered inlay and black headliner to the build list. I’m not 100% sure what paint color I would choose or if I would go the Audi exclusive route to order it in Sprint or Nogaro Blue, or find a way to get the layered dark wood with aluminum inlays. That said, going with Aviator Blue would bring the price point, without destination charges, to a hair under $68,000. Before I jump off the deep end and replace my S5 with an A6 TDI, I would have to see what Audi does with the next-generation A5 family and with the refreshed A6. If Audi does bring over a performance Avant or S5 Sportback to the US, all bets are off on the A6 TDI as my next daily driver. That said, I’m still strongly considering a TDI to power my next Audi. I want to thank Sunset Audi for providing the A6 TDI for the extended test drive and it has made me fall even more in love with it. 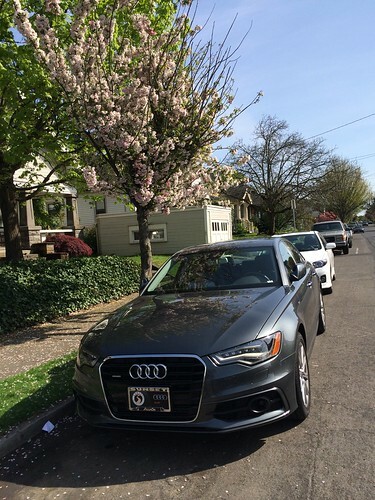 I am an owner of a 2014 Audi A6 TDI with around 75,000 miles. I took part in the North America Emissions settlement program, had all the modifications made, and just followed up with my 75k check up. 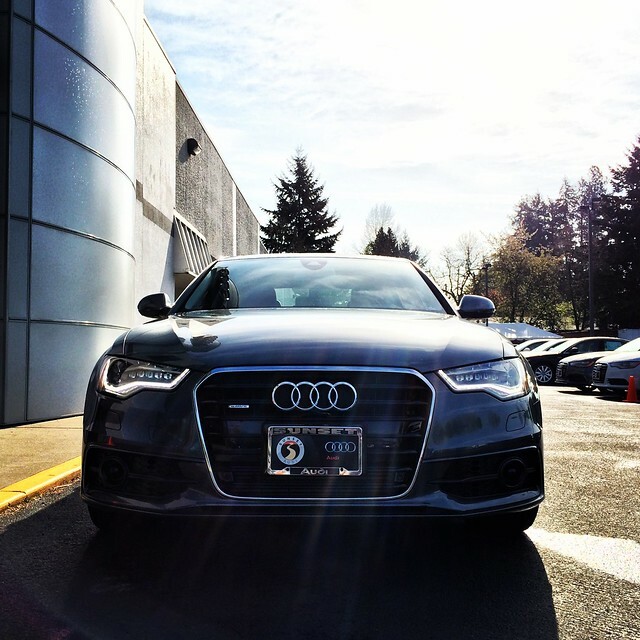 Well, today a light popped up, and I immediately took my car to my Audi dealership. Long story short, Audi came back to me and told me I have a Catalytic converter for a German Audi A6 TDI, and not a USA based Audi A6 TDI. They have no clue how it ended up in my car, and they also have no clue how my car ended up in the USA with that German Model Catalytic converter. Audi, said they would replace the Catalytic converter, pay all service costs, but I have a couple questions. A- do I just go along with their suggested replacement? B- How bad is it that I have been driving a car with this German specific Catalytic converter for the past 5 years and 75k miles. C- I just want the truth, and I feel like with all the negative press over the past few years, they might try and pull a fast one on me. D- Do i make higher demands. Any, and all help would be greatly appreciated. Unfortunately, I’m not too familiar with the differences between the two catalytic converters. My guess is that the one used in US spec cars have to meet the stricter CARB emission requirements; whereas, EU emissions standards may not be quite as stringent or have different requirements regarding soot and particulates. I know there have been some production issues with several models where incorrect components are installed; sometimes minor and sometimes from a different trim in the lineup.